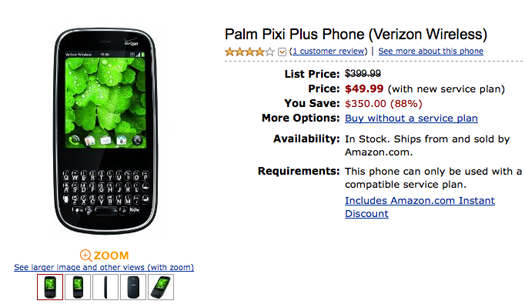 Amazon is now offering the Palm Pixi Plus on Verizon Wireless for just $49.99. This is a $50 savings over the current offer on Verizon Wireless. If you don’t mind two contracts, Verizon is still offering their BOGO (buy one, get one free) on webOS devices. However, for those looking to get in the Palm Pixi Plus at a good price, this is the lowest we’ve seen. As a reminder, the Palm Pixi Plus is essentially the same model that we reviewed, but comes with WiFi.